Got Appetite? ​Here's a News Flash! 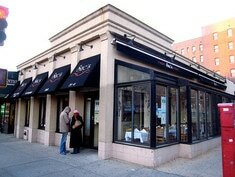 Sac's Place was voted Astoria's Favorite Restaurant and Favorite Pizzaria! Get a taste of specialties inspired by the Abruzzo region of Italy. With recipes that have been handed down from generation to generation, the menu is filled with dishes that feature simple flavors and the freshest ingredients cooked with a passion. Sac's is the place where gathering to eat with family & friends is in itself a celebration. The restaurant first opened in 1989 as a small pizzeria on the corner of Broadway & 29th and was known for cooked specials for their "regular" customers. As demand for these specials grew, Sac's expanded to a full-service restaurant in 1998. Today, all the food is made to order and the coal-brick oven pizza is second to none. Buon Appetito! Got a Birthday? Celebrate your special day with family and friends at Sac's Place and get a BIRTHDAY GIFT CERTIFICATE in the mail. Just complete the information and click "SUBMIT"
Got Appetite to celebrate with family and friends? Get an iGotAppetite Birthday Dinner Gift Certificate in the mail. To get TEXTs regarding reservation status. GIFT CERTIFICATES for Complimentary Birthday Dinners will be mailed to this address.